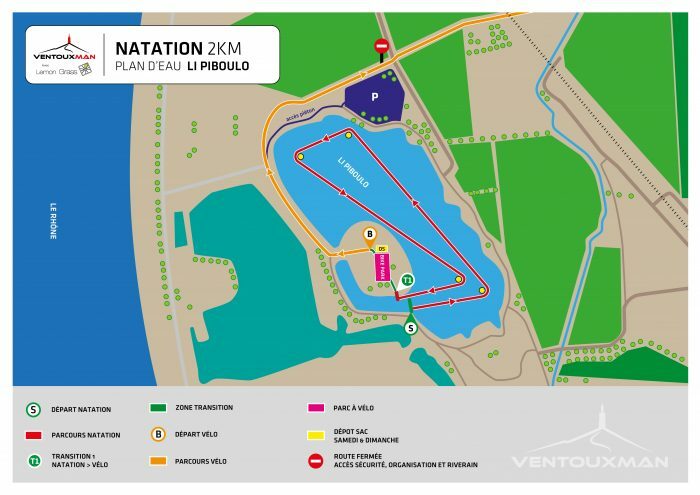 The VentouxMan is a long distance triathlon : 2km swim , 90km cycling and 20km running. The whole event takes place in the Vaucluse department. The start will be the lake of Piolenc, near Orange. 1 loop of 2 kilometers to go in this beautiful lake, exceptionally clean ! The bike course will pass through 17 towns with endpoint climb of Mont Ventoux from Bédoin. From km 30, you walk along the Dentelles of Montmirail through the villages of Seguret, Sablet and Gigondas, a guaranteed show! The arrival in Beaumes-de-Venise at km 45 marks the beginning of serious things. A perfect warm-up before the ascent of the Giant of Provence! You will start to assault Mount Ventoux from Bédoin, MYTHICAL ROAD borrowed by the Tour de France. 21kms of pleasure, at 7.5% average: a special chrono will be installed for the occasion. Once at the top of the Ventoux, you will go down about 6 KM to drop bikes at the Mont Serein station, located a 1400m altitude. This beautiful natural space will allow you to run safely and wilderness, all with stunning views of Mont Ventoux. However it is not a smooth ride: the profile of each loop will put your stretched legs! The route is a loop 5km perform 4 times, typed Trail.